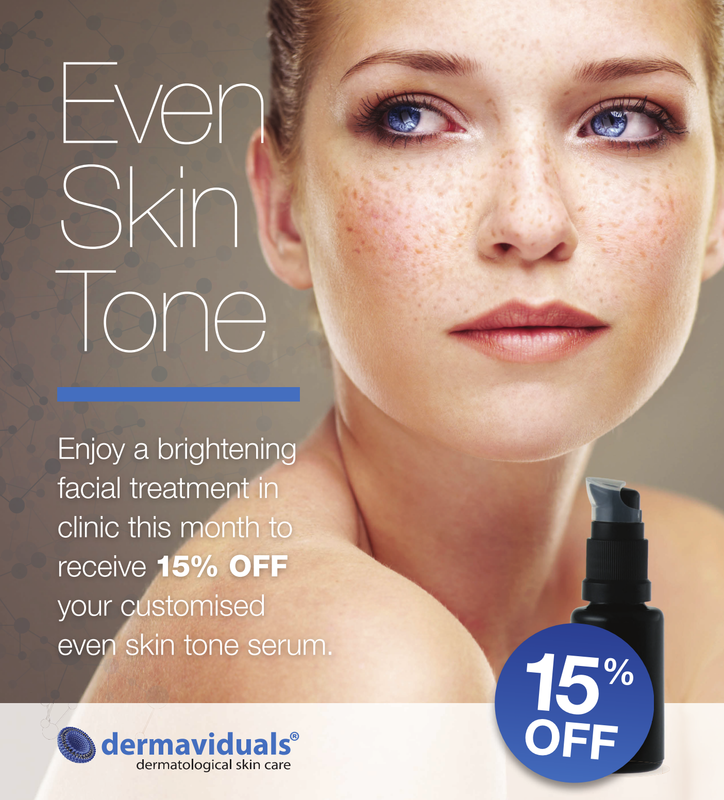 This month, in participating dermaviduals clinics, you can enjoy a brightening facial treatment and receive 15% off your bespoke Even Skin Tone serum. This serum, utilises some of our most powerful serums – Whitening Concentrate, Vitamin B Liposome Concentrate and Vitamin C Liposome Concentrate. Whitening Concentrate helps to decrease age spots & pigmentation by inhibiting tyrosinase and the formation of melanin. Vitamin B Liposome Concentrate supports the prevention of blemished and compromised skin by metabolising lipids and proteins in the skin. Vitamin C Liposome Concentrate stimulates and regulates collagen production, supresses pigmentation and supports the repair of photo-damaged skin. Combined, these actives help you achieve an even complexion and combat pigmentation. The skin’s pigment is produced by a specific skin cell, the melanocyte. This pigment, called melanin, is responsible for our skin, eye and hair colour, but it also acts as a natural sunscreen. That’s why you tan in summer. Hyper-pigmentation is caused by excess production of melanin. This is generally triggered by sun damage and inflammation, but certain medications and hormones can also be a cause. Sun damage will result in age spots, but pregnancy or certain contraceptives can trigger melasma/chloasma. When do we traditionally start to see it? UV-induced age spots typically appear in people over 40, sometimes even earlier when living an excessive outdoor lifestyle. The accumulated oxidative stress over the years leads to damaged pigment cells. They are still functional but in an abnormal manner causing over or underproduction of pigment. Unfortunately, when it shows on the surface, there is more trouble hidden beneath. We recommend finding a skin treatment clinic that uses a skin scanner (such as an Observ or woods lamp), that utilises special technology to make hidden pigmentation visible. Just because you don’t see it, doesn’t mean it’s not already there. Hyper-pigmentation problems start in our childhood and accumulate with ageing. Where does it traditionally start to show? In sun exposed areas of the body like the face, neck, décolleté, arms and hands. Pigmentation can be prevented by the daily application of products that inhibit tyrosinase, an enzyme that controls the production of melanin. Keeping the integrity of the skin intact at all times and avoiding excessively peeling the skin is also vital to preventing pigmentation. Peeling interferes with the skin’s protection mechanism and increases sensitivity. It is a proven fact that an impaired skin will show signs of inflammation, which will increase ageing and age spots. That’s why our product and treatment philosophy is based on corneotherapy. This is the science of maintaining and improving skin barrier function, thus preventing hyper-pigmentation and premature ageing. Always cover up when you leave the house and use sunscreen. Try not to expose too much skin and be sure to wear a broad brimmed hat and large sunglasses to cover your skin from the harsh rays of the sun. The less direct sun exposure equates to the reduced risk of pigmentation. There is no easy fix. We understand the focus on getting rid of spots as fast as possible, but the first and foremost important step is to prevent the formation of further pigmentation and to repair an impaired skin barrier. If your skin shows diffused redness, you will have an impaired barrier. This needs immediate attention. Otherwise any hyper-pigmentation treatment will fail, or even worsen the condition. Our dermaviduals partners are trained in corneotherapy and will increase skin health first, before using targeted products on areas affected by pigmentation. What products help to prevent and treat pigmentation? Ingredients that prevent excessive pigment production working as a melanin suppressor and aid in breaking up existing melanin. Vitamin A (retinyl palmitate) to help regenerate, repair damage and keep cells healthy. Green Tea, a photoprotective, anti-inflammatory, free radical blocker that helps to repair UV induced cell damage. Vitamin E decreases sun induced redness and D-Panthenol soothes and hydrates sun stressed skin. Don’t forget to look out for phosphatidylcholine, Linseed Oil or Kiwi Seed Oil; essential fatty acids necessary for barrier repair and protection. Decisive factor for success is a delivery system for active ingredients that penetrate deep into the skin. Liposomes and nanoparticles have proven successful in doing so. What type of products should we be avoiding? Avoid all products with fragrance or essential oils as they can be photosensitisers and many are known to trigger excess pigment. Only use perfume on your hair or clothes, never directly on your skin. And don’t use bleaching agents like hydroquinone as they are toxic chemicals. What is the importance of sunscreen? Sunscreen still is the most important anti-ageing product! It might seem like an obvious one but always ensure you’re wearing sunscreen and a hat when outdoors! The biggest mistake people make is not applying enough sunscreen to their skin and as a result, the effectiveness of the sunscreen is dramatically reduced. Is there anything you can do DIY? Yes, limit sun exposure! The often recommended application of lemon juice or apple cider vinegar has no effect on melanin production as water soluble substances are unable to penetrate the skin surface. Both are acidic and thus have a very, very slight peeling effect. And as stated before, peeling is not a solution for hyper-pigmentation, and in fact can worsen the problem.